Pixies in a GlassHouse: YA YA YA! 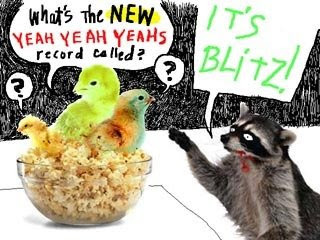 The album is called ITS BLITZ. You can buy yourself a digital copy as of tomorrow, -- OR wait it out to until April 6th, when it hits shelves. Apparently there is some juicy footage to be released as well, which provides an UP CLOSE N PERSONAL look at Karen, Nick, n Brian during the making of the album. oh ... and they are calling it SNAKESWEAT.